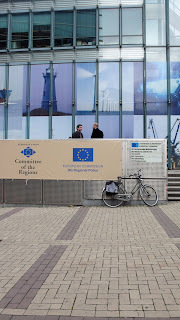 I was in Brussels this week, for a pitch on sustainable transport, EU partnerships and the need to hammer down carbon emissions in the public transport sector. We should be in with a shout: the project is communications support for a number of partner cities (including Manchester) and our consortium was made up of a unique network of agencies specialising in sustainable or green communications. There's always a chance that some monolithic, multinational, boring, über-agency will stomp in and promise the world, but our network of creative, smaller agencies with a strong record on transport and the environment, has to be a winner. Other than the chance of winning the project, the collaboration has been really useful for swapping notes with other people who 'do what we do' in other countries. Here in the UK, I would only really cite Futerra as a fellow traveller of ours, so it's brilliant to discover like minds in Europe. The two other agencies at the pitch were Yuluka in Brussels (who brilliantly pulled together the partnership) and Sidièse in Paris. Both fab, both with ideas and approaches to share. We're thinking about formalising our network into something more high profile, structured around the notion of 'communication responsables', a French-born approach to sustainable communications which I'm busy learning about and which it would do no harm to bring to a wider audience in the UK. Core principles include transparency and honesty; it also appears to be a direct attempt to block ever higher levels of greenwash on the part of major corporates. More anon. The new wallpaper exhibition at the Whitworth - Walls Are Talking - launches in February and our team at Creative Concern have been hard at work designing the promo campaign for the show, which we’re really proud of. 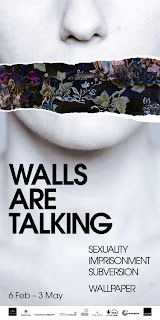 Walls Are Talking is the first exhibition of its kind in the UK, featuring wallpapers by more than 30 internationally known artists including Andy Warhol, Damien Hirst and Niki de St. Phalle. Already well known for its wallpaper collection, the Whitworth is pulling together a genuinely challenging show and we knew that the campaign to promote it had to be every bit as edgy. We worked with the City’s Creative Director, Peter Saville and photographer Graeme Cooper to produce the artwork, which directly responds to some of the core themes that the exhibition explores: subversion, sexuality and imprisonment. The image (see above) features a portrait shown from below the eyes. It is an anonymous face with the mouth torn away revealing a layer of wallpaper. We wanted to capture the concept of the exhibition which is the idea of something passive taking over; ‘if only the walls could talk’. Wallpaper was on my mind over Christmas actually, when I listened again to Stephen Fry’s ‘blessay’ on aesthetics and Oscar Wilde. In the podcast he recounts the time when Wilde was asked his view of the United States, famously responding that the reason that the US was such a violent, brutal place was because its wallpaper was so ugly. As Stephen Fry then draws out, this is typical wildean flippancy at first hearing but actually stems from a deep belief in aesthetics and, critically, in the aesthetics of the everyday. It is the notion that if we care about design and quality and beauty then it will lift the spirits, enrich the human condition, make the world a better place. Which is one reason why I’ll be just as focused on the Whitworth’s huge collection of ‘everyday’ wallpapers spanning several centuries, as well as the pieces submitted by the big name artists. Good design, and beauty, is something we should encounter from the moment we wake until the moment we finally stop Twittering and nod off to sleep. 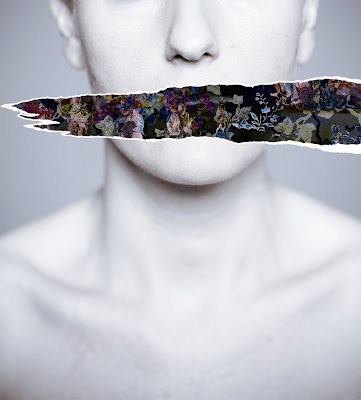 Walls Are Talking opens on February 6 and runs until May 3 and is collaboration with the V&A Museum. 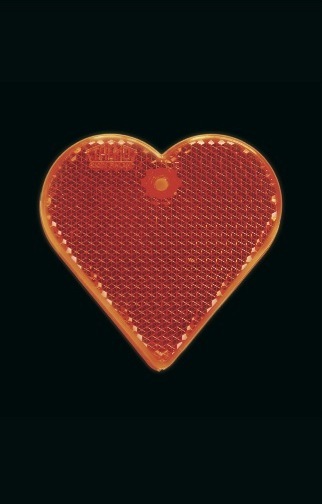 It includes specially commissioned work from artists Michael Craig-Martin and Catherine Bertola. Now I know that Mac Addicts the world over are ridiculed for the glazed, starry-eyed look that comes over them whenever their computers-of-choice are talked about, mentioned or featured in a Hollywood flick... we can see no bad in the cult led by Jobs. All is good in the land of Apple. But even more than usual, I am currently a very, very happy Apple user. In the last few years, in spite of GORGEOUS machines coming out, and an ever-better operating system and the market-changing iPhone (swoon), Apple had a problem - it kept tanking in the environmental stakes. It repeatedly scored low in comparative reports between different manufacturers and so as a result became a target for campaigners; green Mac users like me kept our heads down. 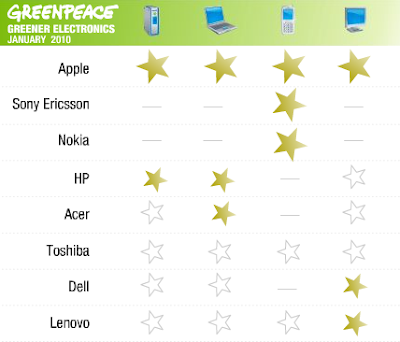 Now we can take heart as Apple has topped a green computer league table published by Greenpeace. Due to innovations like the removal of PVC from cables, or that clever unibody that encases the laptop I'm typing into, Apple has emerged at the head of the league. Bloody lovely stuff. Lovely... but just don't try and get on a tram when those legs get a little tired, as it looks like Greater Manchester is about to vote to continue its ban on tram-borne bikes. So there you go; not impossible; which was actually the conclusion of the Greater Manchester Authorities in 2002 when they “unanimously agreed to the principle of allowing bikes on trams during non-peak hours”. Understandably, our friends at the Friends of the Earth-run Love Your Bike campaign are not best pleased. They think that allowing bicycles to travel on off-peak trams would encourage more people to combine tram and cycle journeys for commuting, shopping and leisure, and be an effective way to reduce carbon emissions. This argument is given greater power once they point out that Greater Manchester's own transport strategy suggests that between 2 and 5 miles is a perfect cycling distance, and that around 90% of the Greater Manchester population will soon be within a 2.5 mile cycle ride of a tram (when the hugely welcome new Metrolink services are completed). The vote on this takes place tomorrow and Love Your Bike is calling on anyone who can to urge the GMITA committee members to honour the pledge made in 2002 and vote to allow cycle carriage on off-peak cycle trams. If you fancy adding your voice, click here to send them an email. P1032452, originally uploaded by shrinkingworld. 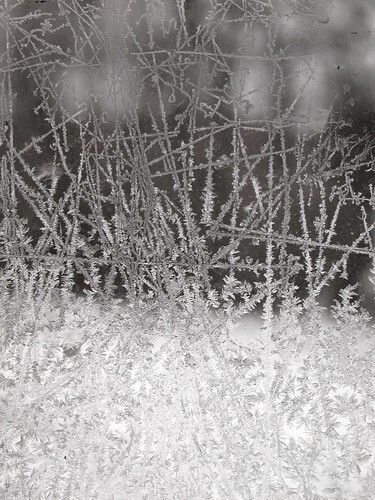 Loved this frost formation on a garage window this morning.